Total number of published refereed journal articles: over 260 papers including 16 Phys. Rev. Lett. ; 10 Appl. Phys. Lett. ; 140 Phys. Rev. B. Total number of citations: over 10000 (google scholar). Click here to view my full publication list. Winner of 1999 Achievement in Asia Award (Oversea Chinese Physics Association). Croucher senior research fellowship award in HK in 2009. 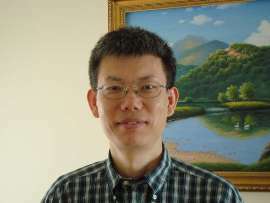 APS fellow in the division of computational physics in 2013. "ab initio modeling of quantum transport properties of molecular electronic devices", J. Taylor, H. Guo and J. Wang, Phys. Rev. B 63, 245407 (2001). The NEGF-DFT formalism, reported in this paper, allows one to calculate nonequilibrium charge/spin quantum transport in nanoelectronic devices including all atomic details without any phenomenological parameter. This work represents a most important step forward in quantitative understanding of nanoelectronic devices, and the formalism we developed has become the de facto standard tool in the field of ab initio modeling of quantum transport of nano-devices. "Quantum Electrodynamics Near a Photonic Band Gap: Photon Bound States and Dressed Atoms", S. John and J. Wang, Phys. Rev. Lett. 64, 2418 (1990). Photonic band gap materials are artificial periodic dielectric structures capable of trapping light in three dimensions without absorption loss. We know that any alternation of electromagnetism, the fundamental interaction governing atomic, molecular and condensed matter physics, will lead to fundamentally new phenomena. In this paper, we discussed one of the new phenomena of quantum electrodynamics of localized light: the formation of photon-atom bound state due to the strong coupling between light and atom near photonic band gap. In the photonic band gap, this strong coupling leads to an anomalous Lamb shift which is observable. "Quantum transport theory for nanostructures with Rashba spin-orbital interaction", Q.F. Sun, J. Wang, and H. Guo, Phys. Rev. B 71, 165310 (2005). We have derived a Hamiltonian for systems with spin-orbit interaction as well as electron-electron interaction based on non-equilibrium Green's function method. Our work has laid a foundation for future nano-spintronics first principle calculations. This Hamiltonian has become the standard model for quantum spin transport using the theory of non-equilibrium Green¡¯s function. "Persistent spin current in a mesoscopic hybrid ring with spin-orbit coupling", by Q.F. Sun, X.C. Xie, and J. Wang, Phys. Rev. Lett. 98, 196801 (2007). In this paper, we have addressed one of the most general features of spin-Hall physics, namely the possible existence of persistent spin current. Indeed, the persistent charge current is the hallmark of mesoscopic physics, its investigation over the last twenty years has provided great insights to coherent quantum transport physics. Our work is the first to address persistent spin current, and we provide strong evidences of its existence and its interesting behavior. "Disorder-Induced Enhancement of Transport through Graphene p-n Junctions", by W. Long, Q.F. Sun, and J. Wang, Phys. Rev. Lett. 101, 166806 (2008). Due to the recent success in fabrication of graphene, a single-layer hexagonal lattice of carbon atoms, great attention has been attracted in the research of graphene. It was found experimentally that new conductance plateaus emerge at fractional conductance quanta when the disorder is present in the graphene p-n junction. We have given theoretically explanation for this new phenomenon and our numerical results agree quantitatively with experimental data. You are the visitor of this page since Mar. 1, 2016.